Lateral flow immuno-chromatographic assays commonly known as lateral flow assays, are devices used in laboratories to detect the presence and/or absence of an analyte in a given sample. This is a cheaper alternative to other diagnostic techniques and is associated with use in laboratories, point of care set ups and home healthcare. One of the common applications is in the home pregnancy detection kit. Other similar home testing applications are expected to drive the growth of this market. Apart from this, the increase in occurences of infectious diseases is about bound to augment the opportunities for the lateral flow assay market. The need to adhere to complex norms and regulations can potentially impact the market. 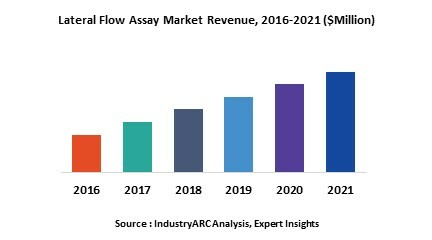 North America currently accounts for the largest share of the global lateral flow assay market and this trend is expected to continue till the end of the forecast period. A large number of lateral flow assay manufacturers are spread across North America and Europe. North America and Europe are relatively mature markets for lateral flow assays and will have lower growth rates compared to emerging economies in Asia Pacific and South America. Favorable conditions in these regions such as heightened awareness and demand of healthcare and growth in the healthcare infrastructure market are driving the growth of this market in these regions.